What a wonderfully detailed painting of one of my favorite subjects! Happy Easter to you and your family, too. Oh my gosh! This is amazing! Your work is so inspirational to me. I too, love to paint little things like this, that catch my eye. Your paintings are beautiful! Good looking egg, Happy Eater to you too, I hop eyou have a wonderful Easter with your family. I can't tell you how much my mouth is watering! What a great Egg! Looks tasty too :)! What a way to capture the textures! Happy Easter! Yummy, I wish I could find chocolate eggs from Beijing. Looks delicious! I hope you enjoyed your egg, it looks delicious. Debra, this is so good it actually made my mouth water. I reached over the table and snapped a piece of my daughters Easter chocolate off! (She shouldn't have left it there). Yum! I love the detail. Stunning ! wonderful work...looking delicious, too! Oh, yum! 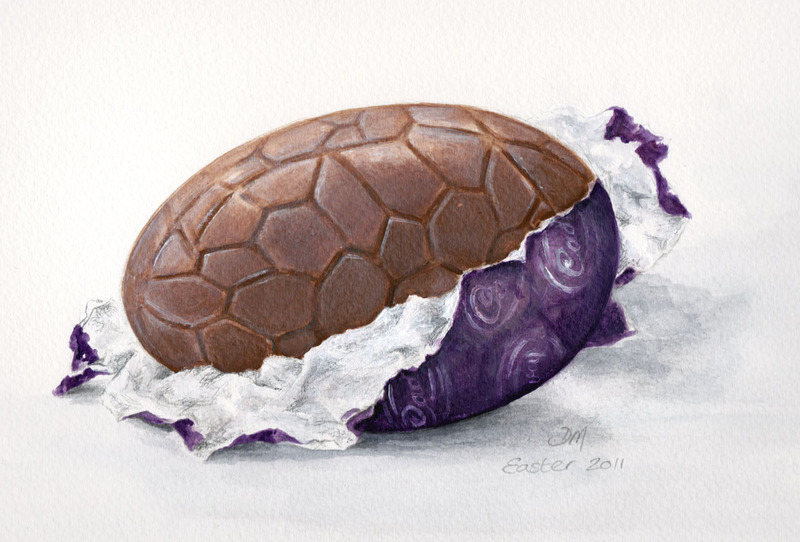 Nothing better than a chocolate egg! Beautiful!